Pursue the Rebellion's subversive agents across the galaxy with the ImperialAssault Carrier Expansion Pack for X-Wing! Designed for use within the game'sCinematic Play and Epic Play formats, the Imperial Assault Carrier ExpansionPack's pre-painted Gozanti-class cruiser miniature comes accompanied by twoTIE fighter escorts, eleven ship cards, and twenty-six upgrades. Additionally,the expansion includes a set of four new missions for Cinematic Play thatfollow a Gozanti charged with intercepting and destroying agents of the RebelAlliance. 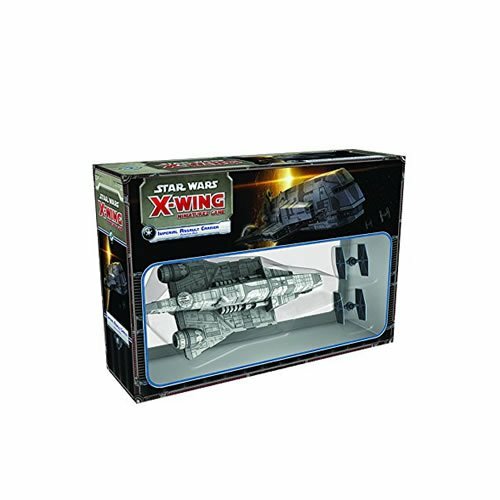 From the Manufacturer Pursue the Rebellion's subversive agents across the galaxy with the ImperialAssault Carrier Expansion Pack for X-Wing! Designed for use within the game'sCinematic Play and Epic Play formats, the Imperial Assault Carrier ExpansionPack's pre-painted Gozanti-class cruiser miniature comes accompanied by twoTIE fighter escorts, eleven ship cards, and twenty-six upgrades. Additionally,the expansion includes a set of four new missions for Cinematic Play thatfollow a Gozanti charged with intercepting and destroying agents of the RebelAlliance.